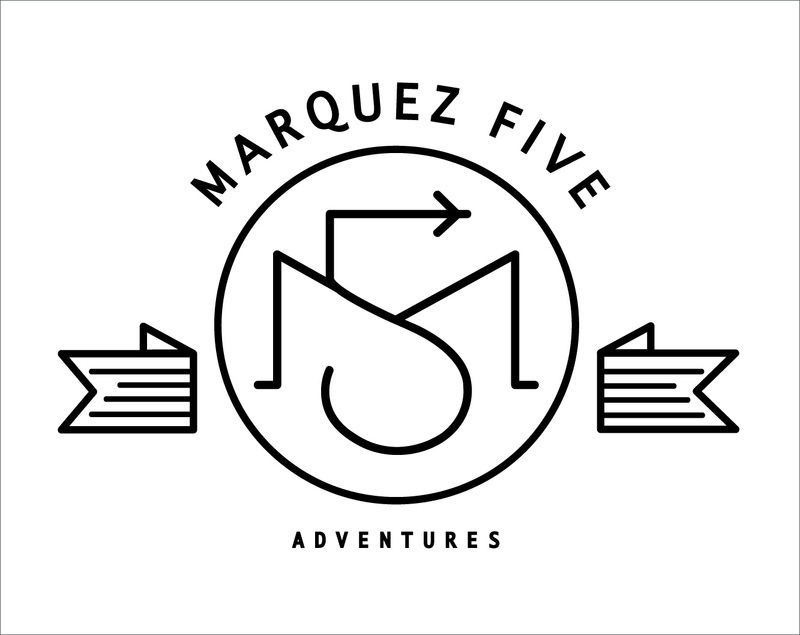 One of my favorite parts of traveling is the planning that goes into it. 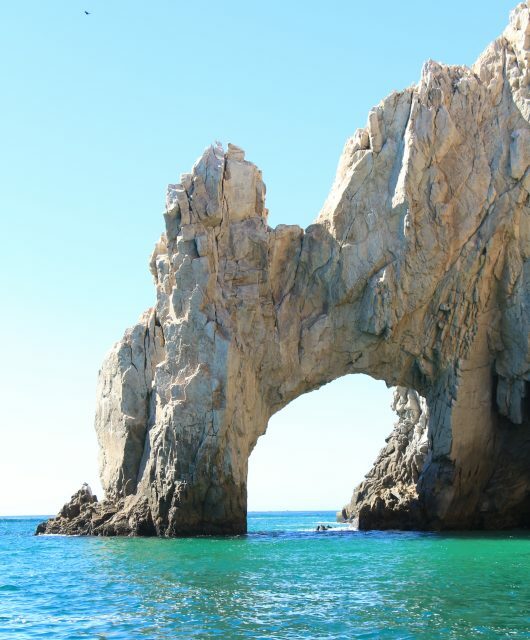 I love to pour through books, magazines and online resources to put together the perfect itinerary for our family. 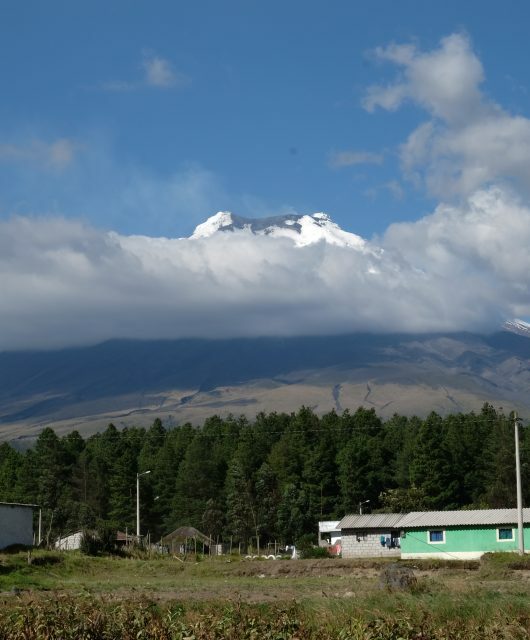 So then why did we choose to travel with an organized group on our recent trip to Costa Rica?  I won’t travel with just any group and a lot of vetting went into selecting the right tour for us. 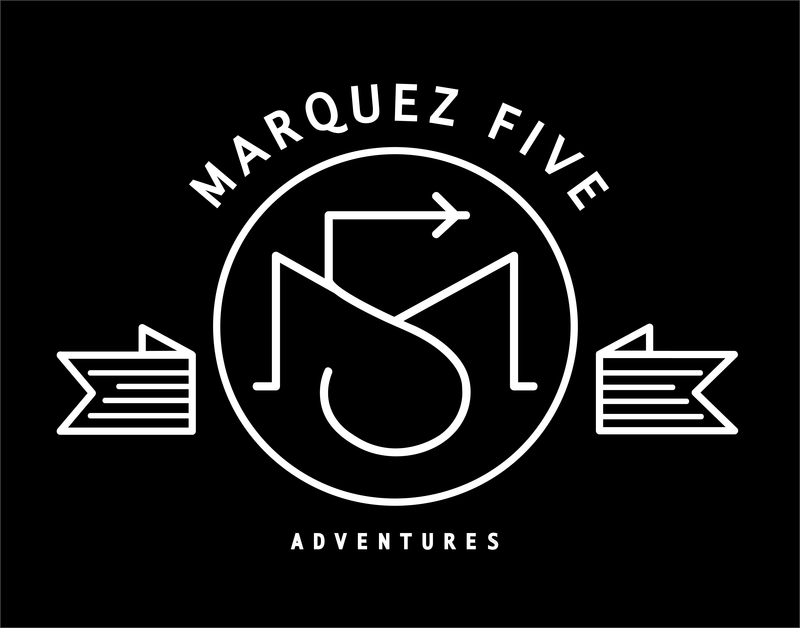 I had heard really great things about Thomson Family Adventures and it seemed like a good fit for our family so I wanted to give it a try. 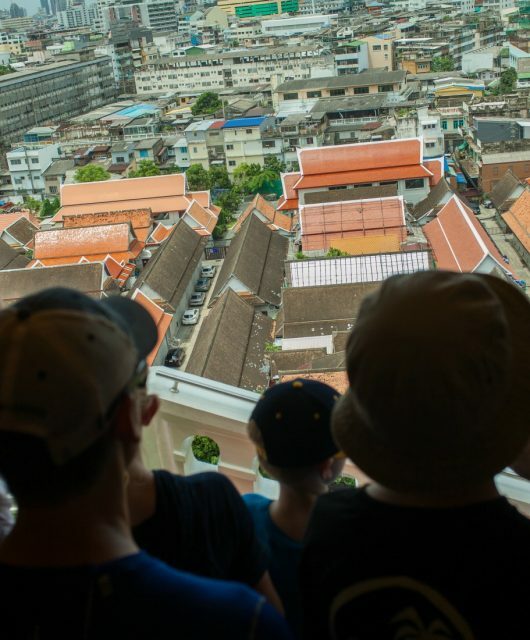 Thomson specializes in family adventure travel, they organize their trips around school holidays, and they keep their groups small (we were with one other family from New Jersey with a 7-year-old son). Plus, sometimes it’s nice for me to sit back and let somebody else worry about all the logistics and I just need to show up! 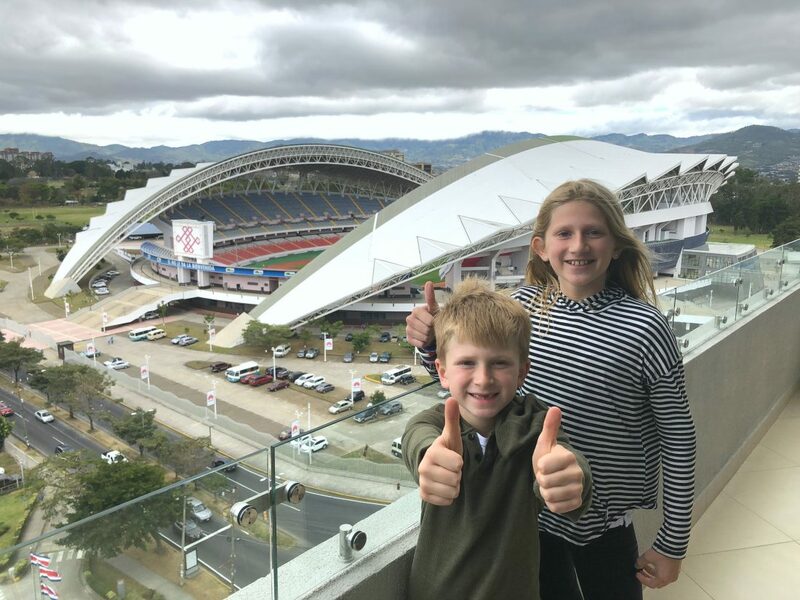 We booked the Costa Rica multi-sport itinerary that fell during our kids’ Presidents Week school break. 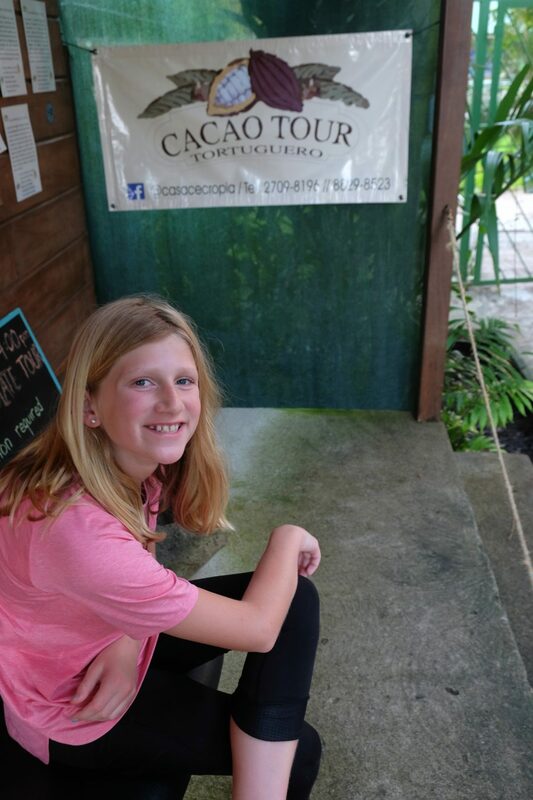 We first traveled to Costa Rica in 2014 and our kids have been asking to go back ever since. 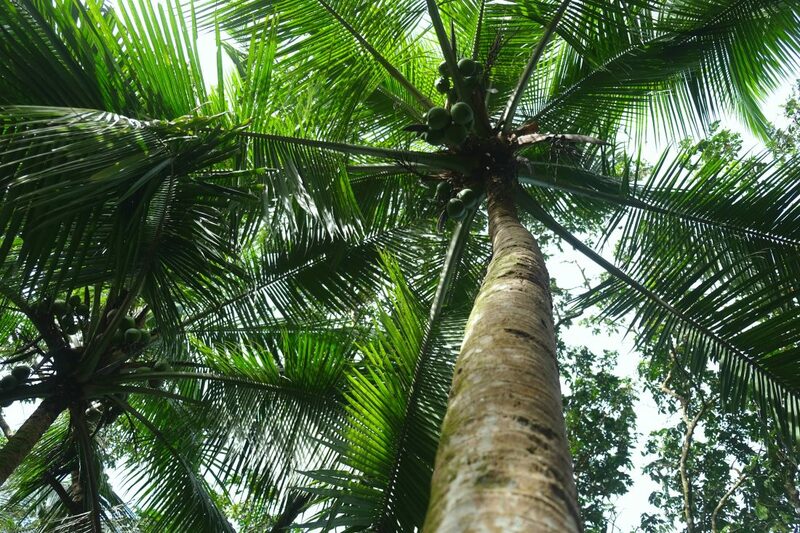 The itinerary with Thomson took us to places in Costa Rica where we hadn’t yet been. 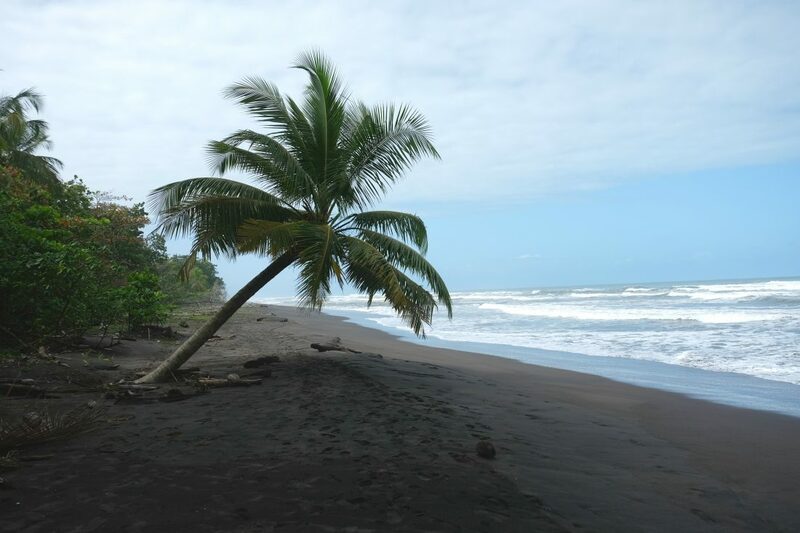 We spent one night in San Jose upon arrival and the next morning headed to Tortuguero on the Caribbean side where we stayed for 2 nights. Next we went to Manuel Antonio National Park on the Pacific side where we stayed for another 2 nights. Finally we returned to San Jose for one last night and flew out the following day. 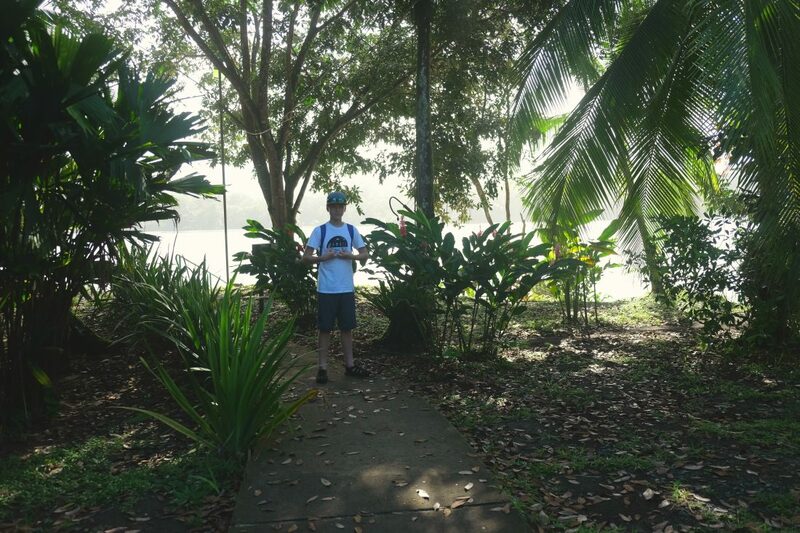 I’ll write about our entire trip in detail – this first post is about our first full day traveling from San Jose to Tortuguero. 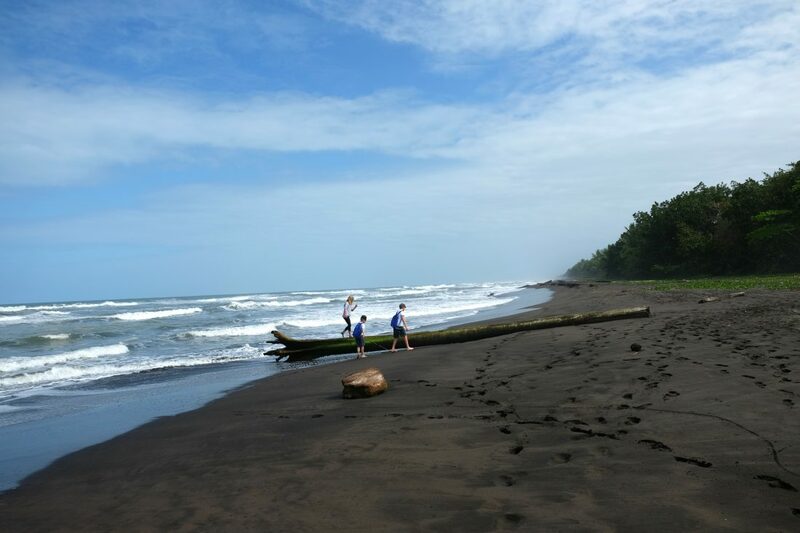 Tortuguero is located on the northern Caribbean coast of Costa Rica. Getting there requires a bit of time and effort, but it’s well worth the investment. 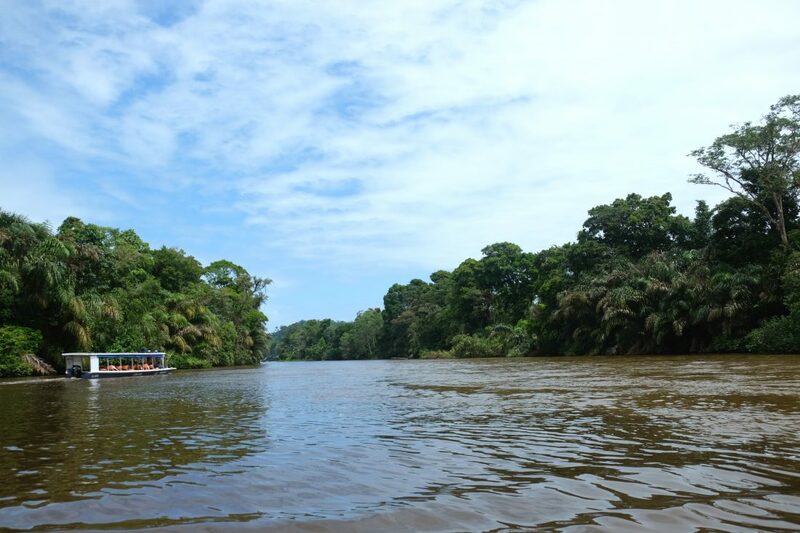 Tortuguero is accessible only by boat or plane. We traveled by bus as far as the road would take us (about 3 hours from San Jose) and then caught a river boat to take us the rest of the way there (about an hour more). After leaving San Jose we traveled down the mountain through a cloud forest and then drove through banana plantations. 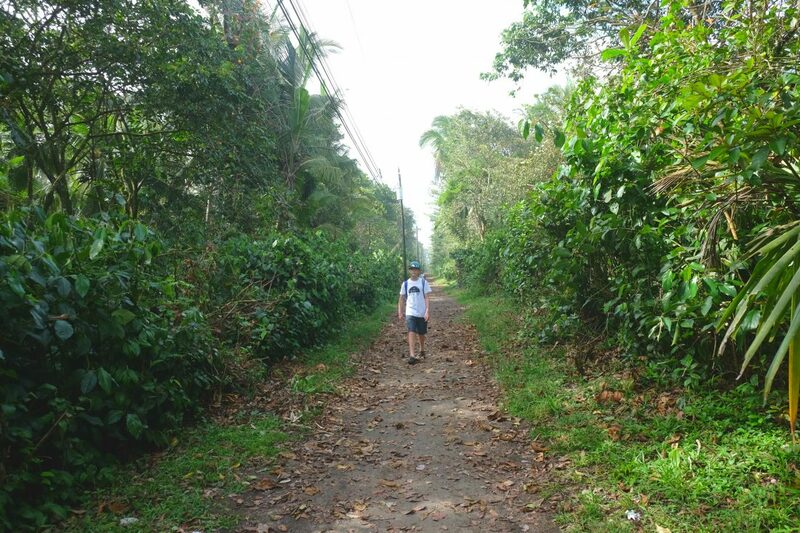 Along the way, our guide spotted some monkeys and sloth’s so we got out to take a look. 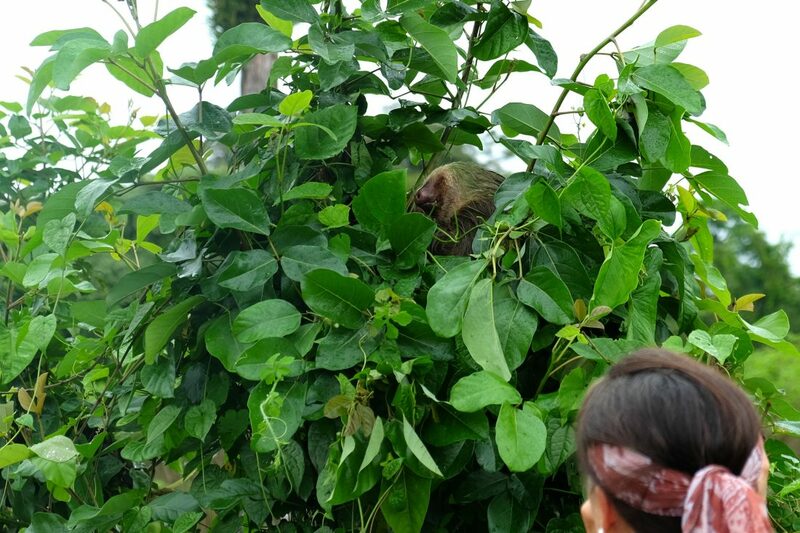 Notice that the sloths fur has a green tint to it – that’s algae which grows on its fur to help it camouflage. 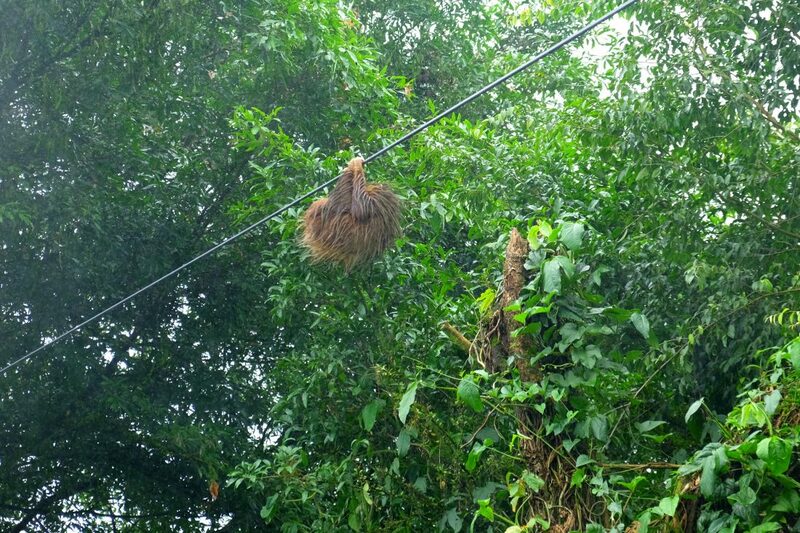 Our first wildlife spotting – a sloth! Notice his green fur? That’s algae! The sloths really did look like they were moving in slow motion. This guy hanging from a wire would lift his hand off and reach for a new spot, but it took what felt like 30 seconds to complete the move! We arrived at a large gathering area with lots of other busses full of people getting onto the little river boats. 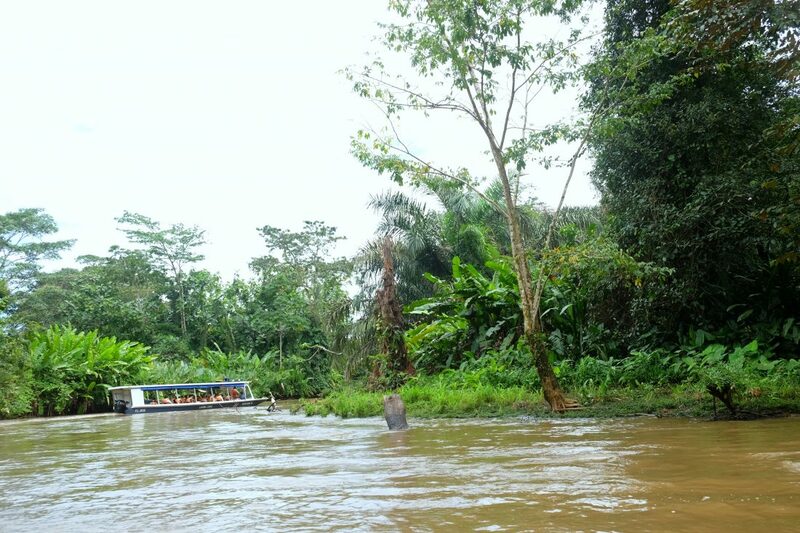 Our hotel, Mawumba Lodge, had a boat waiting for us so we climbed aboard and set out to navigate our way to Tortuguero through the maze of canals. 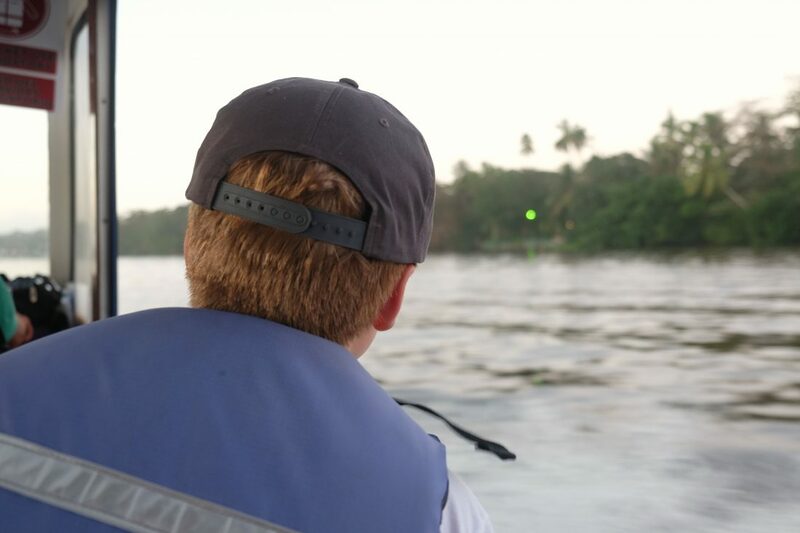 Our captain stopped or slowed down several times so he could point out interesting birds and one large crocodile basking on the riverbank. After checking in at Mawumba Lodge, we settled into our rooms and then had a little bit of time before lunch. 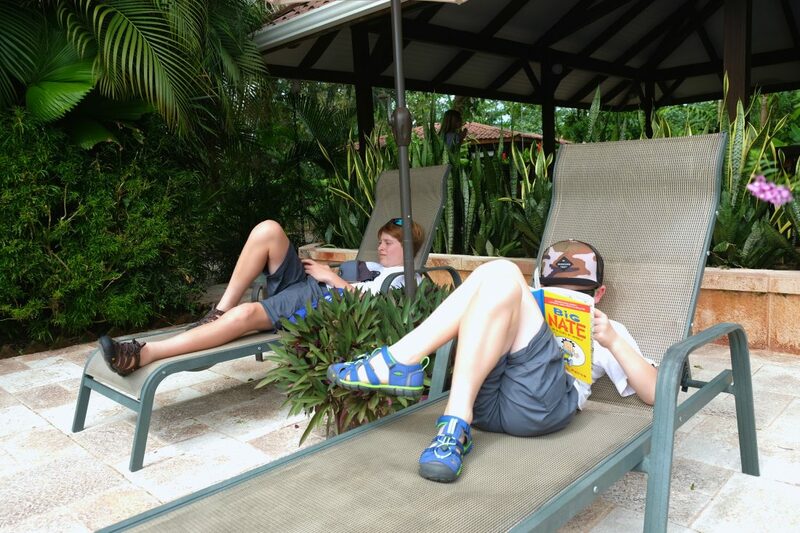 The kids loved relaxing in the hammocks on our porch and around the hotel. The boys found some lounge chairs by the pool where they waited until lunch was ready (the open-air restaurant is right behind them). Because we traveled with a group, we didn’t do any hotel research, but were very happy with the hotel. The property was lush, beautiful and well manicured. The rooms were comfortable and a good size without excess furniture like desks & TVs. There was wi-fi in the common areas (pool, restaurant, bar, lobby), but not in the rooms. 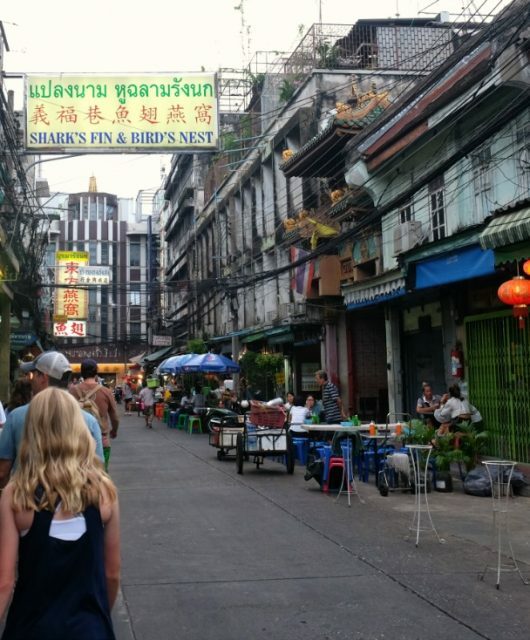 Our meals were all included – the only thing we paid extra for was drinks from the bar. We loved the location too. The narrow island (not much wider than the length of a football field) is bordered by the canal on one side and the Caribbean Sea on the other and we were on the island with the main town. Other hotels were on islands/land bordered on both sides by the canals so a boat was required to get to the sea. We were warned that the sea was much too dangerous to swim in, but we loved exploring the beaches and getting our feet wet. After lunch we made our way into town via the beach and a cute little path that paralleled the beach. 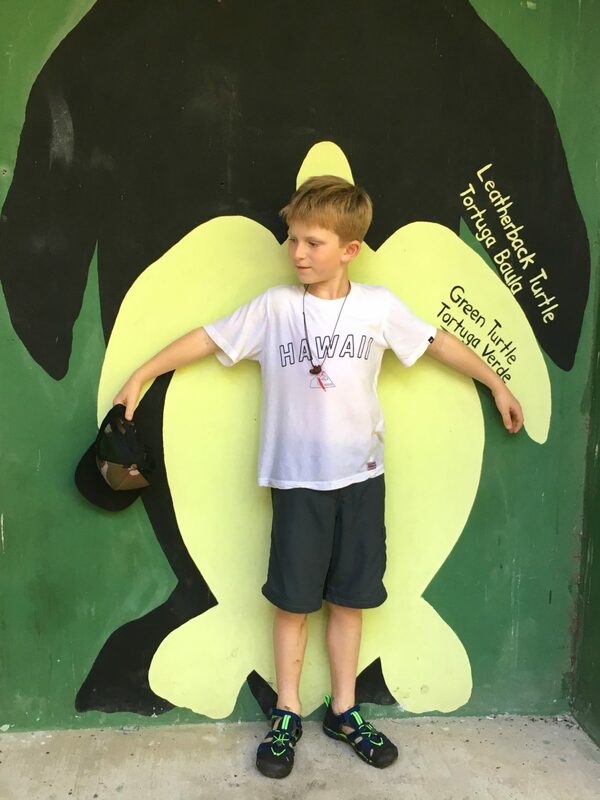 Our first stop was the Sea Turtle Conservancy where we learned about their efforts to protect sea turtles. 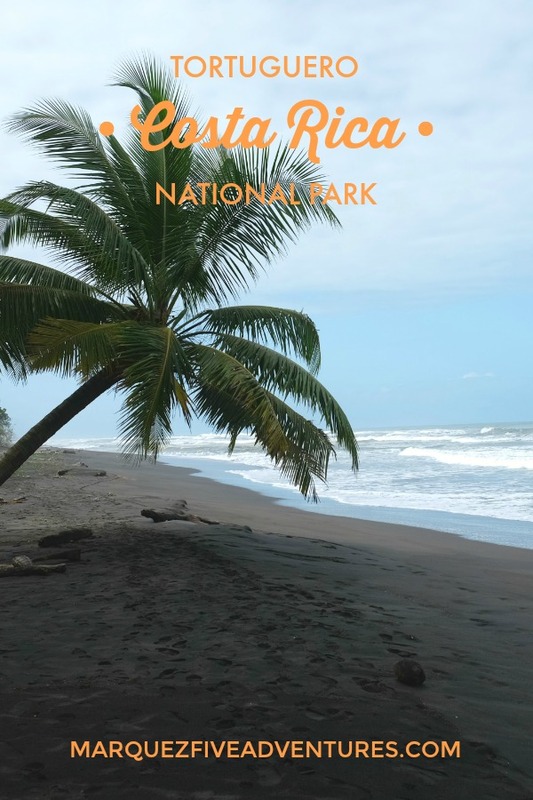 Tortuguero was declared a national park in 1975 to help protect the sea turtles which were being killed en mass for their meat, eggs and shells. The Conservancy monitors nesting trends, growth rates and reproductive success. For $30 we adopted a turtle and received an adoption certificate, a subscription to their membership publication (we’ve already received our first edition!) and the honor of naming the turtle! As you can imagine, trying to get three kids to agree on one name under a time constraint was challenging. 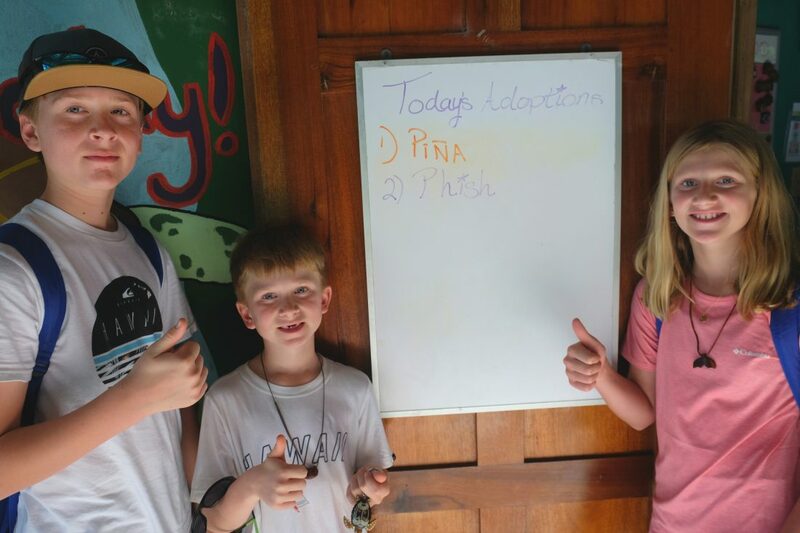 They finally (reluctantly) agreed on “Fish” and to make it more interesting spelled it “Phish”. When the turtle returns to nest we will also get updates on how she’s doing. Next we ran (literally) to make it in time for our cacao tour at Casa Cecropia from husband & wife team (Rafael & Claire). We learned about the history and production of cacao beans into chocolate and we got to participate the whole way through. 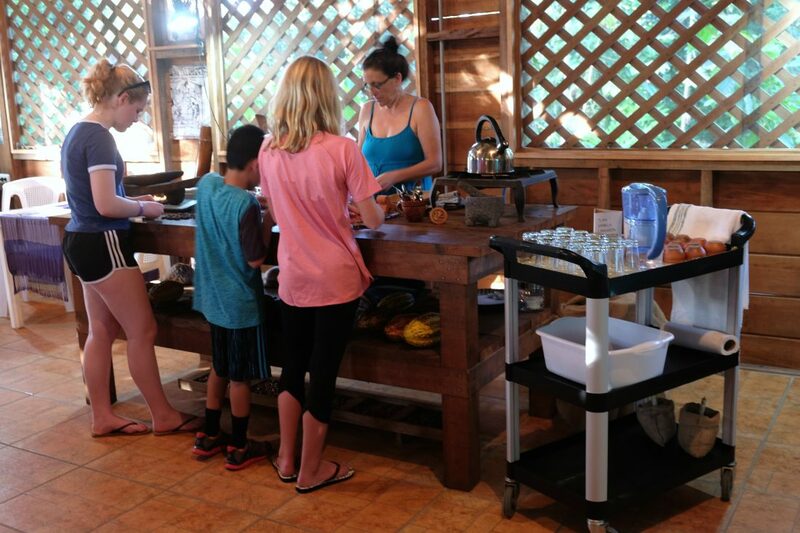 We saw the cacao trees growing in their yard, tasted the beans straight out of the fruit and at every step in the production including dried, roasted and then in hot chocolate where we got to mix in our own ingredients (vanilla, chili pepper, cinnamon, etc). 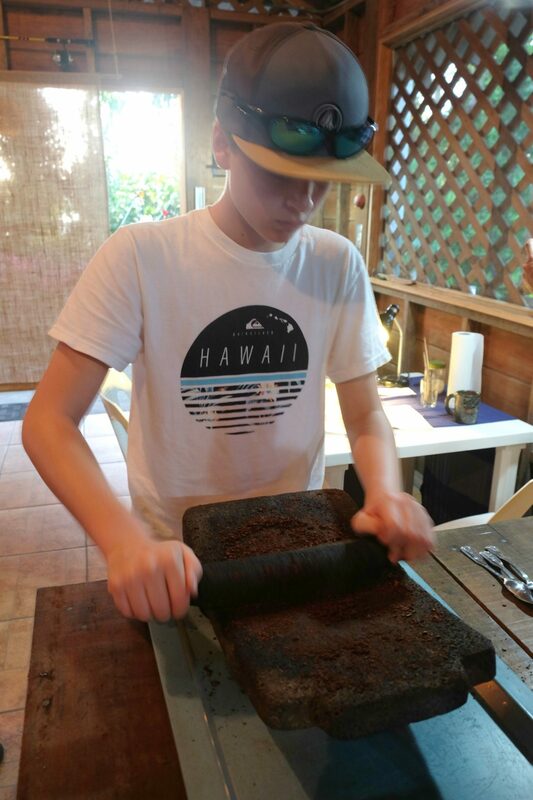 Grinding the beans on a volcanic slab. Before we left, they offered to give us cacao tattoos. They warned us that it would stay on for about 10 days (12 days later they have faded to where we can barely see them anymore). Because of our kids fair coloring, they added some food coloring to the liquid so they could see the paint going on. 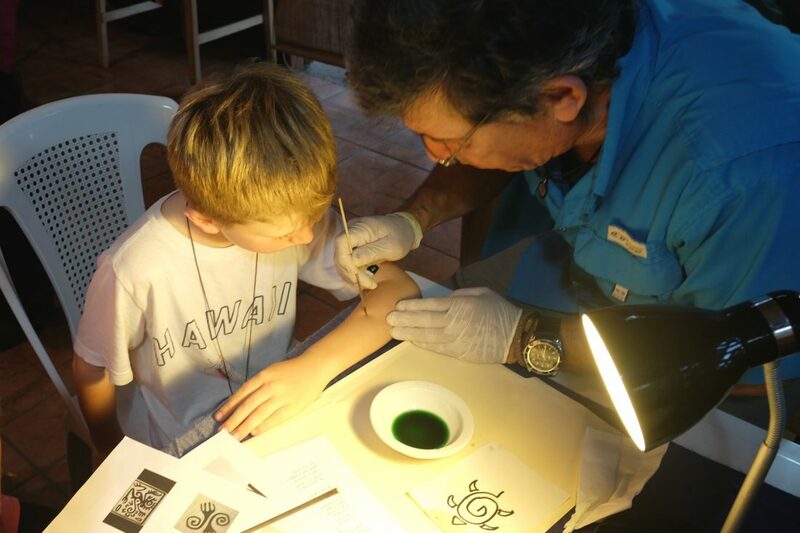 The kids loved getting “tattoos”! 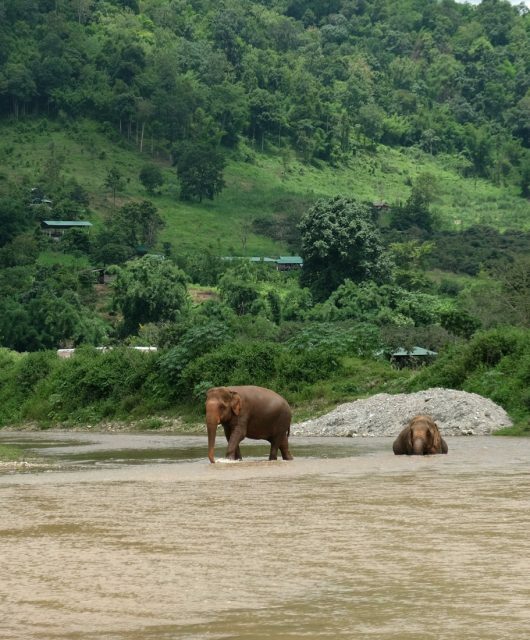 After the tour we hopped into a river boat and returned to our hotel for dinner and to rest up for our jungle safari the following day. We got around by either walking – or boating!